The weather for most of the UK has been dominated by cool and unsettled conditions in the first half of June. A succession of frontal low-pressure systems have stalled over or close to the south of the country, bringing large amounts of rainfall in some areas, particularly in Wales and southern England. Based on provisional mid-month stats, the beginning of June has been significantly wetter than average. The UK as a whole has had 55.5 mm of rain so far this month, 76% of the normal amount of rainfall expected for the month of June. Normally at this point in the month, we would expect to see around 43% of the monthly average. 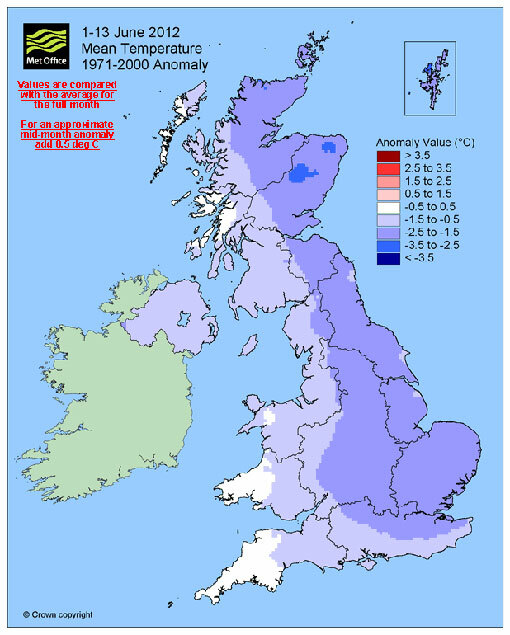 However, the south of the UK has had considerably more. Thorney Island, Shoreham Airport and Wiggonholt – three stations in West Sussex – have all set new station records for June, with over 200% of their usual rainfall for June falling already. Further north, it’s a different story, north-west Scotland in particular has actually been very dry. Resallach, in Sutherland, has only had 1 mm so far, just 0.9% of its average rainfall for June. It’s also been cooler than average for many, particularly in the east, as can be seen on the map below. Mean temperatures for the UK so far this month are 1.4 °C below the long-term June average although cloud cover has kept minimum temperatures closer to the seasonal norm, especially in the south-west. This entry was posted in Met Office News and tagged Average, june, Met Office, rain, temperature, weather. Bookmark the permalink. Charles, the Map shows rainfall compared to the typical rainfall over the whole month. As the rainfall fugures are only up to the 13th June you would expect a total of around 43% at that point in the month. Hope this helps. I studied in Germany and am working currently with weather observations. Here I am dealing with observations of weather in Europe. The frequency of rain are currently observations that I noted and evaluation. Also in Germany, the tides are in the wet.